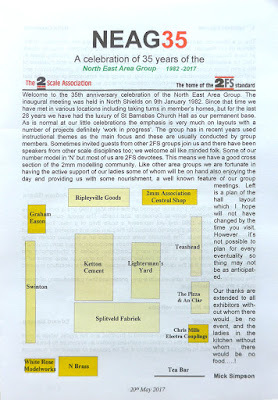 Lightermans Yard travelled to Bournmoor Co Durham to take part in the celebration of 35 years of the North East Area Group which was well attended by 2mm Association members. 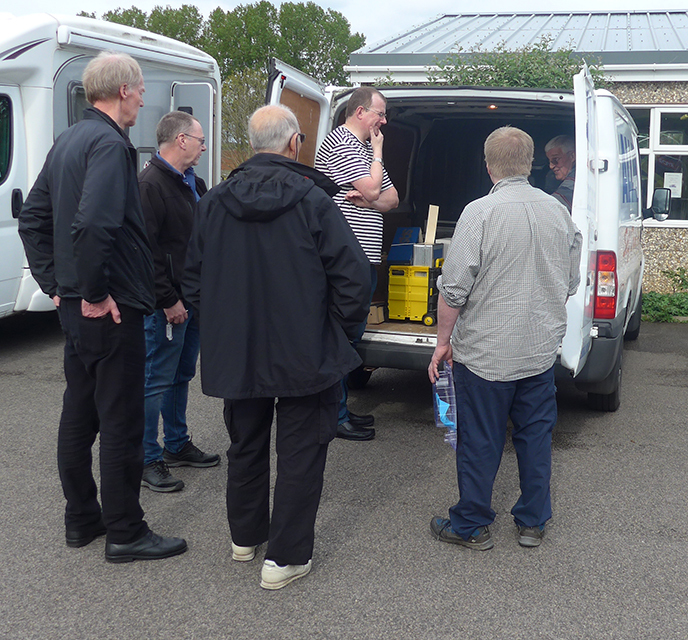 Four from the Kent & Essex Group, Pete K, Keith, Alan S and Richard, were joined by our West Country and Yorkshire honorary members, Pete Townsend and Tom Cutting - quite like old times! 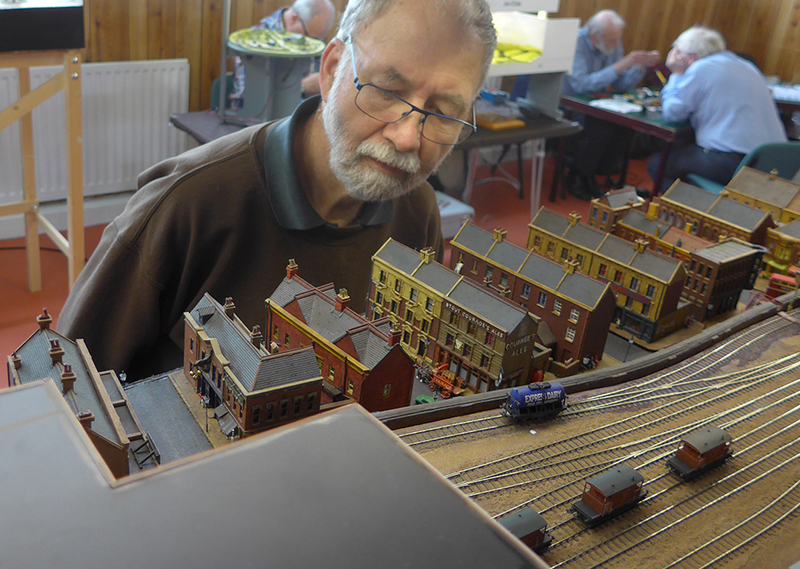 The layout arrived in a hired van, thanks to Alan, Keith and Pete, and was quickly unpacked and up and running. 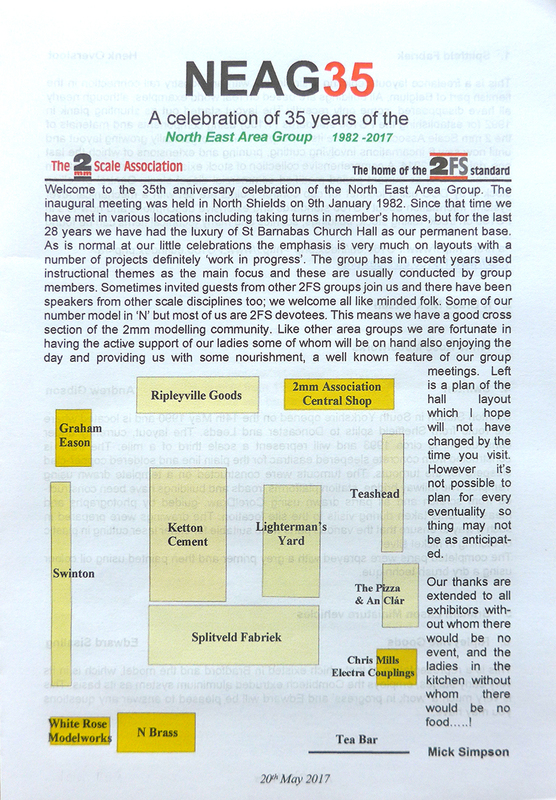 (above) Mick Simpson prepared a leaflet for the day with notes on each of the exhibitors and traders. 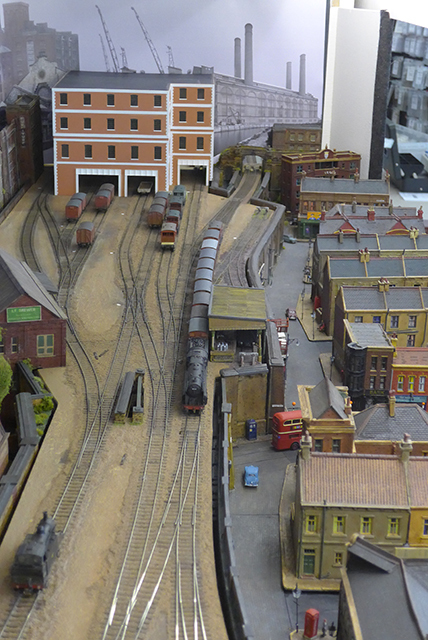 Trackbed and some of the scenics in place. 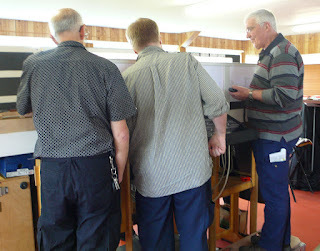 Ready for operation and viewing. 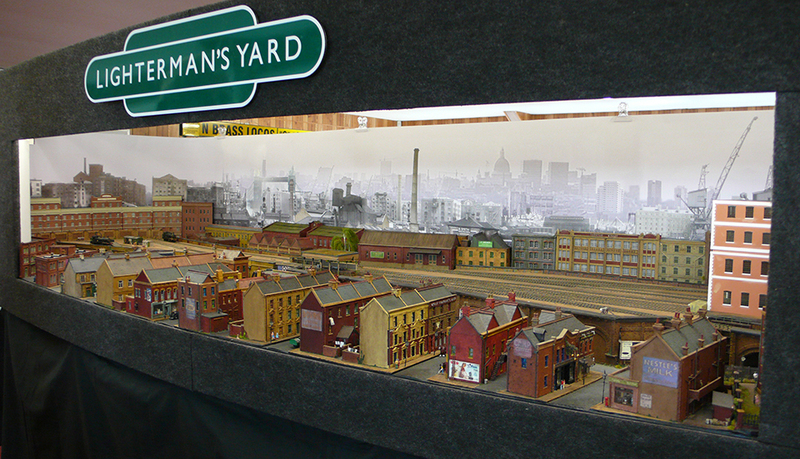 Revised backscene in place. 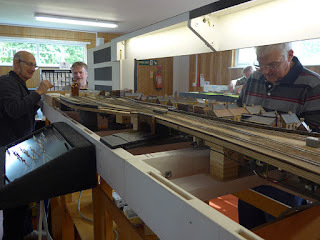 One of the operating teams in action; Pete K, with Tom and Pete T getting the feel of the new MERG controllers, the layout having recently been converted to DCC. 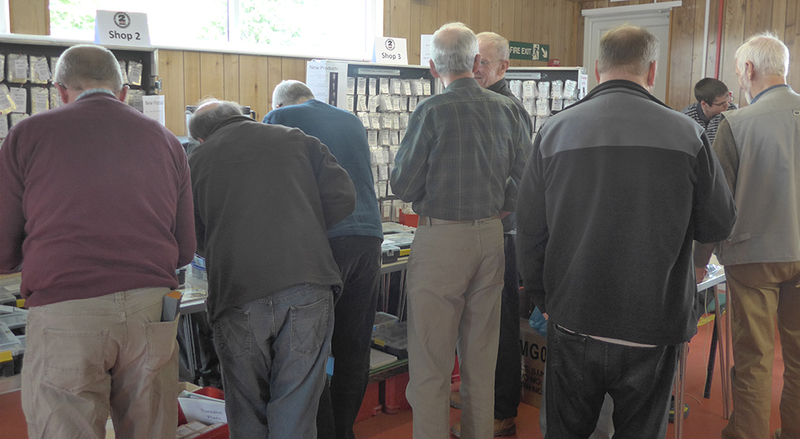 The Shop doing a brisk trade and (below) Mick Simpson announces the lunch arrangements - in three sittings! 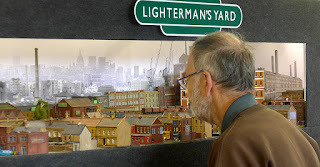 Legend has it that when, about 25 years ago, Lightermans Yard was in its planning stage, the then Kent & Essex team lighted on 'Cannonsgate Goods Depot' a small finescale shunting layout designed and illustrated by Iain Rice in his book 'An Approach to Model Railway Layout Design'. Here is the man himself confronted by an interpretation of his original concept (below). The Lightermans Yard track layout has followed the Cannonsgate plan, but the buildings and street scenes (mostly the work of Pete Townsend) play a significant role in placing the layout in the South East of London, a view re-enforced by a photographic collage of the London skyline depicted in Richard's back scene. 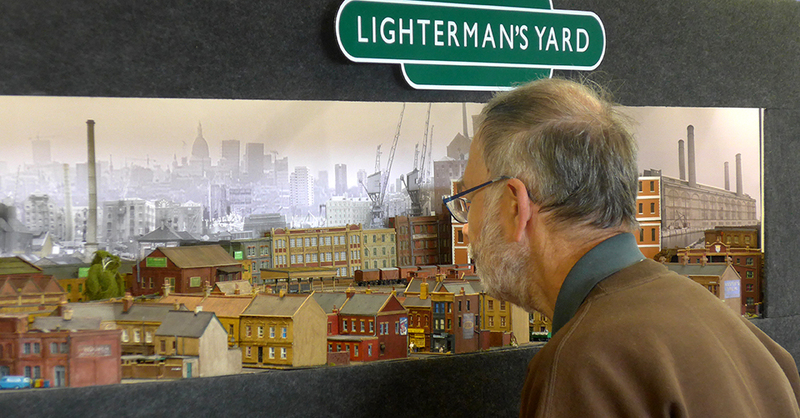 Iain takes a closer look at the detail in the street scenes. An unusual meeting - the layout wasn't present, it was scattered between various members' homes, in transit between last month's appearance at Epsom and next week's trip up to Bournmoor. 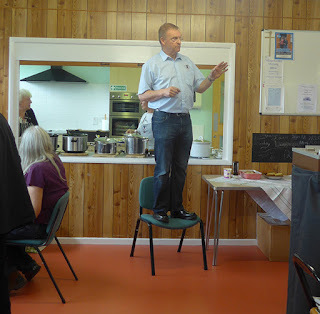 So instead of the usual tweaking and gremlin hunting, we had a wide-ranging round-table discussion. 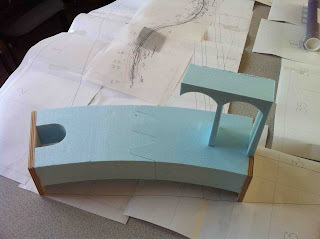 Logistics and timetable for the Bournmoor trip were discussed and agreed, together with a potential extension/diversion to collect various machinery and material from the late Bill Blackburn's collection to allow the association to continue to produce PCB sleepers. 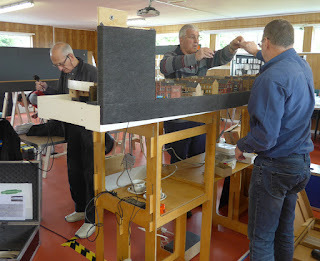 The only photo-worthy item on display was David S' Co-Bo in an almost finished state (just needs the body fastening more firmly to the chassis...). 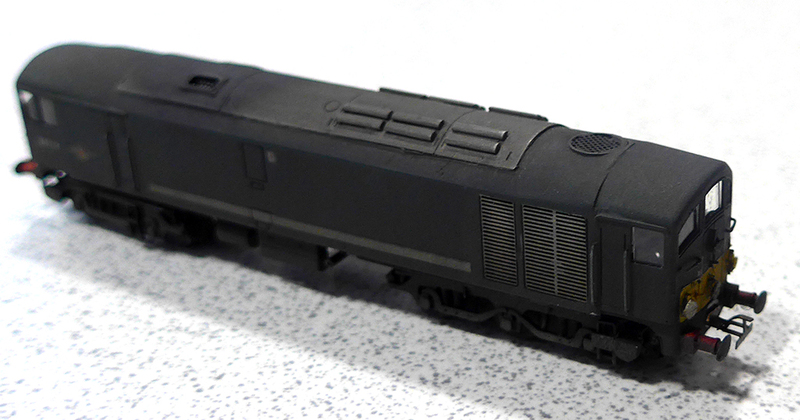 It uses the Worsley Works scratch aids for the body, with a scratch built chassis. Unfortunately the lighting conditions were poor, but I hope these pictures (mostly from Richard) will give some idea of the real item, though they don't do justice to the weathering. 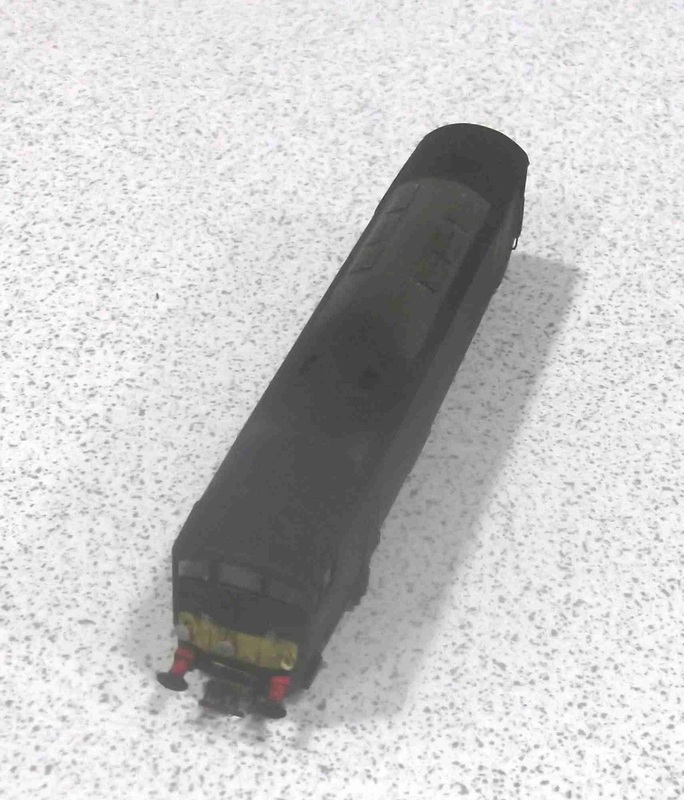 It previously appeared in the September 2016 issue of the blog, complete with a Thomas-style smiling face! I think it was agreed that 1961 was going to be the normal operating period - any earlier and the Post Office Tower would need to be removed from the backscene, any later and it would become difficult to justify continuing use of steam locos. Which led on to discussion of building a couple of 08 shunters - Keith and David S already have one each, but expressed reservations about them.